This is not a case of someone forgetting to note an error in the report or somehow being negligent. The computer simply does not list this blatant error in the summary. Scary. Please send me the photo of this parasha, if possible. Tizku lemitzvos. I dont have it but you can see the mistake clearly in the scan. 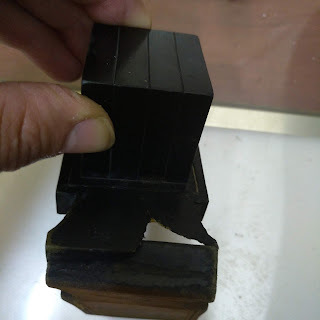 I am so Happy that you posted "WHY COMPUTER CHECKING IS NOT RELIABLE"
As you know I run the Beis Yisroel Torah Gemach to provide Schluchem etc. with Primary and Secondary Torahs until they have their own solution. Most of the Torahs in the Gemach are used Torahs. I always pay the Sofer by the hour and never pressure them with time. The computer has been programmed with out choice and this causes many false positives. I run the risk of having the Sofer look at the report and not making a thorough check. A Family in Crown Heights found a Torah that their Father had left over and wanted it placed via the Gemach to a Schliach. They asked me to get the ready and check if it was Kosher and ship it to the Schliach where the whole Family would rededicate the Torah. I decided to use a Sofer that had been asking me for work and was charging me less then I normally pay per hour. He checked the Torah and said it was ready for shipping. I picked up the Torah and he showed me how clean it was and had worked on it for a long or longer time then I was used to. I took the Torah to the Shipper that I use. He packs and makes the Torah ready to be shipped as art work and insures the Torah for a high amount as instructed by the Rabbi of the Torah Gemach. the packer decided to take a look at the Torah before wrapping. He noticed that a word was missing and called me to ask if he should ship it or not. I told him I would pick it up to get it fixed and not to ship. I spoke to the Sofer, He told me that he was on his way to Israel and could not be involved anymore in checking or fixing. I said it is his responsibility. He told me he say that their was a sticker that showed that it has been checked by one of the Stam placed i.e. computer checked so he didn't check so carefully and concentrated more on cleaning the klaf. I was so upset. 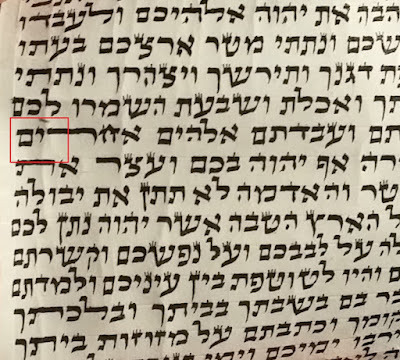 I took the Torah to my regular Sofer as a rush Job and forgot to tell him where the person found the word missing. 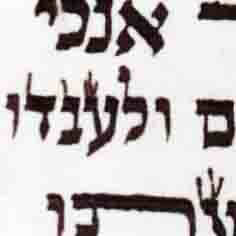 The Sofer started checking on a different section and found another word missing. At this stage a computer check was warranted. I did the computer check and BH these were the only words missing and at the end of the day the Family had to take and fly with the Torah to the Hachnosa. If you have a good Sofer that you work with don't let anyone push you. If the machine is not broken don't fix it. The old method is sometimes better then the new. Had the new Sofer done what he should have then I would not have had this issue. needless to say I have not used the Sofer again. I have started to tag the Torahs in the Gemach with RFID passive Tags which is a pilot program. So far we have tagged over 50 Torahs. The last thing I learned was that If you are doing a Mitzvah, Hashem will watch over you. What were the chances that two words were missing so close to each other and the packer would spot one of them? Its important to note that there are two types misuse of the computer checking. One is what I refer to above, namely that people rely on the computer for spelling and check only for other errors when doing their manual check. This is wrong, both practically and halachically. Halachically, the computer should not be used as a substitute for manual spell checking, it only compliments it. The second are people who don't even do a manual check, they rely on the computer for everything. This is totally ludicrous and clearly the computer is not designed to catch the vast majority of common errors, particularly incorrectly formed letters. This highly unscrupulous practice is more common with sifrei Torah.